The year has just begun and Ariana Grande is leaving us all anxiously waiting for her next album. Grande just revealed the cover art and tracklist for her highly anticipated fifth album “Thank U, Next” as well as it’s release date: February 8th. Grande’s latest singles “imagine” and “7 Rings” left many Arianators wanting more. 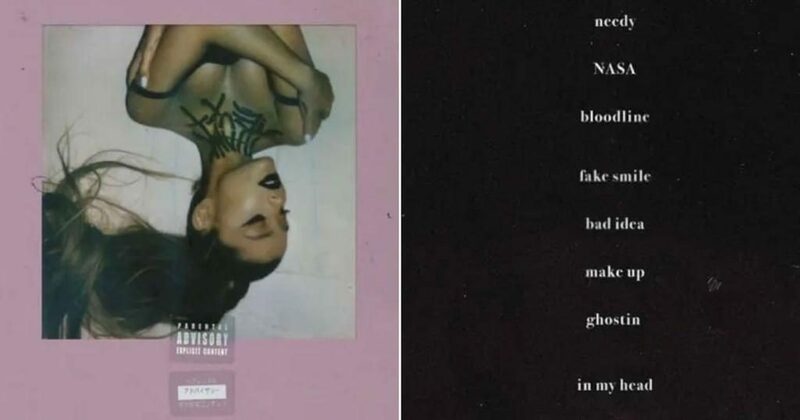 The album cover features Ariana in her iconic ponytail with the album title painted on her chest, black lipstick which was inspired by her mother, and similar to her fourth studio album “Sweetener” she is taken from the upside-down angle. Grande took to Twitter to break down details about the cover, which she says might be her favorite so far. Ariana revealed the inspirations behind some of her songs, including “In My Head.” “Being in love with a version of somebody you’ve created in your head. Falling for someone that they are not,” she tweeted. She also established “Ghostin” saying, “Feeling badly for the person you’re with because you love somebody else. Feeling badly because he can tell he can’t compare…. and how I should be ghosting him.” Grande talked about “Bloodline,” which may have been about her relationship with Pete Davidson. “Wanting somebody but not enough to have them in your bloodline,” she tweeted. Although her iconic single “7 Rings” was certainly a crowd pleaser as it is an ode to independence, female friendship, and retail therapy. The line “You like my hair? Gee thanks.. Just bought it,” received backlash for how when women of color wear fake hair it is looked down upon, while white women are praised and glorified. Grande was quick to apologize on Twitter saying that her intentions were never to offend anyone. Since her split with Pete Davidson, Grande has released a steady stream of empowering, self-love focused hits so the upcoming album must be one to mark down in your calendars because as most of Twitter can agree it is about to break 2019.